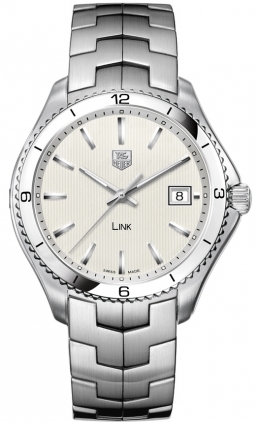 The Tag Heuer Link could almost be mistaken for an unusually small and intricate ice-sculpture. This 40mm watch sports a silvery white dial and a finely brushed stainless steel casing, bezel, and linked strap. There is a date window at three, and the hour and minute hands are plated with silver-white rhodium—which is a non-corrosive precious metal. Rhodium is also non-reflective, which helps if you are trying to read the time under bright light. With luminescent markers on its hands and indexes, this watch is also easy to read in the dark. Pros: This watch runs on a quartz movement, which I would almost always consider to be a pro because it’s about as reliable as you can get when it comes to telling time. A quartz-powered watch typically runs on a battery connected to a quartz crystal. The current produced by the battery causes high-frequency vibrations in the crystal which in turn power the watch. The high frequency of these vibrations ensures accuracy. A quartz battery will need to be replaced approximately every two years, but keep in mind that this particular timepiece includes an “end-of-life indicator” meaning that when the battery begins to lose power, the second hands will make “four-second jumps every four seconds.” So, if your second hands begin to behave peculiarly, you know what’s going on. 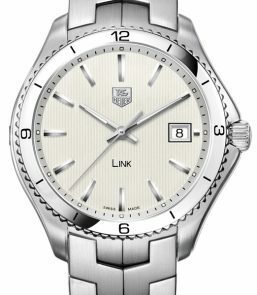 However, Tag Heuer also reminds consumers that despite this little quirk “the movement continues to display the exact time until the battery is exhausted.” Other pros include the fact that the scratch-resistant sapphire crystal covering the dial has also received a double anti-reflective treatment. Furthermore, this watch includes a security feature on its clasp so as to prevent the watch from opening at an inopportune time and falling off—say into the depths of the ocean. However, even if it does fall into the ocean, rest assured that it is waterproof to a depth of 100m, which is about 300 feet. Possible cons: If you want to change your watch battery on your own, you will need a tiny screwdriver. Otherwise, you are encouraged to take it to a store specializing in Tag Heuer watches. This watch boasts two features that signal longevity and reliability: stainless steel and quartz. It is also attractive and its color scheme is neutral enough that it could be worn almost anywhere with almost any outfit. To me, these factors alone make it a worthwhile purchase.